a tribute to ancient traditions. With its rich origins and creative nature the possibilities are infinite. From the more introspective, healing and listening 'Lunar' to the more extroverted, expressive and joyful 'Solar'. Examples of Solar ingredients are basic acrobatic techniques, inversions with spotter, acrobatic flying and creative movement and creativity. Examples of Lunar ingredients are massage, partner yoga and therapeutic flying. On Friday we open up the weekend workshop with the theme Community. flying fun. Enjoy being in a team as we rise our potential together. Wind down and let yourself be cradled in Metta, loving kindness. In this class we will immerse ourselves in nurturing Thai massage. Dedicate our present moment to giving and receiving. Relaxing, releasing and letting go. Thai massage as a meditation on Metta, loving kindness. 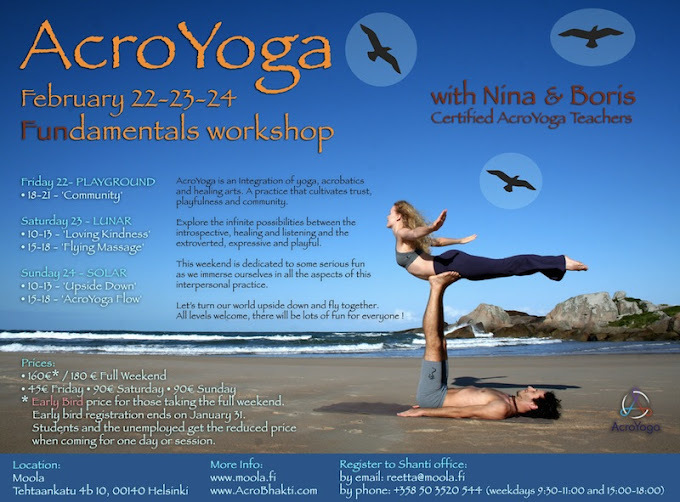 Yogic awareness, postures and breath emphasis together with massage and acrobatic technique. It all comes together in therapeutic flying, a flying massage experience where the main tools are gravity, sensitivity and presence. Develope listening inwards and outwards aswell as a deeper understanding and more flair when it comes to aeronautics in AcroYoga. Feel deeply and just be. Hone the trust in each other. Give and receive support. Inhale, exhale. Arm balances and flying postures turns our world upside down and brings out our inner child. Join this class for lots of fun as we step by step get comfortable with different kinds of inversions. This class is an inclusive space for all. For the 'terrified' practitioner who still dreams about being upside down we offer a safe and supportive environment. To the more experienced lover of inversions we offer more challenges and possibilities. Acrobatic flying at its best. Flowing with a sequence of postures. Infinite possibilities coming alive like a mandala. We will practice all three roles; base, spotter and flyer. We help each other reach spaces we did not know was possible. Come feel the flow ! and are familiar with working with movement in general. Friday class will be open to all curious. No partner necessary, we work together in different group constellations and also in a circle with everyone present. Boris & Nina invites to serious playfulness, humble co-creation and pure presence. With a warm hearted pedagogy they make everyone feel included and rise to their own potential. Thanks to their common interest in movement and creativity with a life affirming attitude they found each other and ever since they teach and perform together around the globe. Passionated about sharing the bliss of AcroYoga wherever they go. * Early Bird price for those taking the full weekend. Early bird registration ends on January 31. Students and the unemployed get the reduced price when coming for one day or session.